Human LEAP-2 precursor cDNA and deduced amino acid sequence. Coding regions are printed in capital letters. The typical secretory signal sequence 1–22 is printed in italics, whereas the positions of introns 1 (198 bp) and 2 (320 bp) of the LEAP-2 gene are marked by vertical lines. Two TATAAA sequences located 31 and 84 bases upstream of the translational start were identified. The putatively mature and antimicrobially active LEAP-2-(38–77) isolated from hemofiltrate and the putative polyadenylation signal are underlined. The position of the primers used for nested 5'-RACE-PCR and for preparative PCR from six different species is indicated. Alignment of LEAP-2 from mammalian species. Standard PCR carried out with primers originally designed for the human LEAP-2 gene revealed homologous LEAP-2 forms in rhesus monkey, cow, pig, mouse, and guinea pig. The depicted putative peptide sequences are deduced from the cDNA sequences obtained. Underlined amino acids represent the putative signal peptide sequences as predicted by the SignalP V2.0 program (Nielsen et al. 1997), and the mature LEAP-2 (38–77) form is hyphenated. The nucleotide sequence data reported in this paper have been submitted to the GenBank/EBI Data Bank with accession numbers AJ306405 (Homo sapiens mRNA), AJ409013 (Sus scrofa mRNA), AJ409014 (Bos taurus mRNA), AJ409054 (Cavia porcellus mRNA), AJ409055 (Mus musculus mRNA), AJ409056 (Macaca mulatta genomic DNA), AJ409063 (Mus musculus genomic DNA), AJ409064 (Homo sapiens genomic DNA), and AJ409065 (Homo sapiens alternative promoter sequence). Ghrelin, an appetite-stimulatory hormone secreted by the stomach, was discovered as a ligand for the growth hormone secretagogue receptor (GHSR). Through GHSR, ghrelin stimulates growth hormone (GH) secretion, a function that evolved to protect against starvation-induced hypoglycemia. Though the biology mediated by ghrelin has been described in great detail, regulation of ghrelin action is poorly understood. Here, we report the discovery of liver-expressed antimicrobial peptide 2 (LEAP2) as an endogenous antagonist of GHSR. LEAP2 is produced in the liver and small intestine, and its secretion is suppressed by fasting. 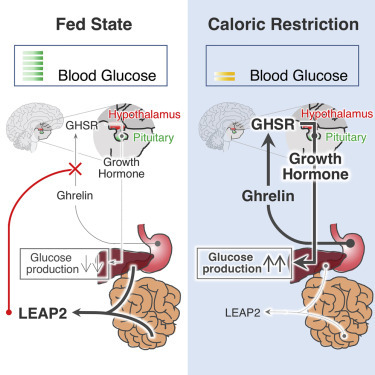 LEAP2 fully inhibits GHSR activation by ghrelin and blocks the major effects of ghrelin in vivo, including food intake, GH release, and maintenance of viable glucose levels during chronic caloric restriction. In contrast, neutralizing antibodies that block endogenous LEAP2 function enhance ghrelin action in vivo. Our findings reveal a mechanism for fine-tuning ghrelin action in response to changing environmental conditions. Identification and functional characterization of the house finch interleukin-1beta. Interleukin-1β (IL-1β), an inflammatory cytokine of the IL-1 family, is primarily produced as a precursor protein by monocytes and macrophages, then matures and becomes activated through proteolytic catalysis. Although the biological characteristics of avian IL-1β are well known, little information is available about its biological role in songbird species such as house finches that are vulnerable to naturally-occurring inflammatory diseases. In this study, house finch IL-1β (HfIL-1β) was cloned, expressed, and its biological function examined. Both precursor and mature forms of HfIL-1β consisting of 269 and 162 amino acids, respectively, were amplified from total RNA of spleen and cloned into expression vectors. HfIL-1β showed high sequential and tertiary structural similarity to chicken homologue that allowed detection of the expressed mature recombinant HfIL-1β (rHfIL-1β) with anti-ChIL-1β antibody by immunoblot analysis. For further characterization, we used primary splenocytes and hepatocytes that are predominant sources of IL-1β upon stimulation, as well as suitable targets to stimulation by IL-1β. Isolated house finch splenocytes were stimulated with rHfIL-1β in the presence and absence of concanavalin A (Con A), RNA was extracted and transcript levels of Th1/Th2 cytokines and a chemokine were measured by qRT-PCR. The addition of rHfIL-1β induced significant enhancement of IL-2 transcript, a Th1 cytokine, while transcription of IL-1β and the Th2 cytokine IL-10 was slightly enhanced by rHfIL-1β treatment. rHfIL-1β also led to elevated levels of the chemokine CXCL1 and nitric oxide production regardless of co-stimulation with Con A. In addition, the production of the acute phase protein serum amyloid A and the antimicrobial peptide LEAP2 was observed in HfIL-1β-stimulated hepatocytes. Taken together, these observations revealed the basic functions of HfIL-1β including the stimulatory effect on cell proliferation, production of Th1/Th2 cytokines and acute phase proteins by immune cells, thus providing valuable insight into how HfIL-1β is involved in regulating inflammatory response. Park M, Kim S, Adelman JS, Leon AE, Hawley DM, Dalloul RA. Identification and functional characterization of the house finch interleukin-1β. Dev Comp Immunol. 2017;69:41-50. Overexpression of Leap2 impairs Xenopus embryonic development and modulates FGF and activin signals. Besides its widely described function in the innate immune response, no other clear physiological function has been attributed so far to the Liver-Expressed-Antimicrobial-Peptide 2 (LEAP2). We used the Xenopus embryo model to investigate potentially new functions for this peptide. We identified the amphibian leap2 gene which is highly related to its mammalian orthologues at both structural and sequence levels. The gene is expressed in the embryo mostly in the endoderm-derived tissues. Accordingly it is induced in pluripotent animal cap cells by FGF, activin or a combination of vegT/?-catenin. Modulating leap2 expression level by gain-of-function strategy impaired normal embryonic development. When overexpressed in pluripotent embryonic cells derived from blastula animal cap explant, leap2 stimulated FGF while it reduced the activin response . Finally, we demonstrate that LEAP2 blocks FGF-induced migration of HUman Vascular Endothelial Cells (HUVEC). Altogether these findings suggest a model in which LEAP2 could act at the extracellular level as a modulator of FGF and activin signals, thus opening new avenues to explore it in relation with cellular processes such as cell differentiation and migration. Thiébaud P, Garbay B, Auguste P, et al. Overexpression of Leap2 impairs Xenopus embryonic development and modulates FGF and activin signals. Peptides. 2016;83:21-8. Immune activation in HIV/HCV-infected patients is associated with low-level expression of liver expressed antimicrobial peptide-2 (LEAP-2). BACKGROUND: Immune activation is one of the main features of HIV/Hepatitis C virus (HCV) infections and has been linked to the disturbance of the gut-associated lymphoid tissue (GALT). In chronic HIV infection, loss of GALT integrity results in translocation of microbial products and chronic immune activation. We explored the relationship between bacterial translocation and specific colonic proteins, including liver expressed antimicrobial peptide (LEAP 2) which may play a role in modulating the bacterial translocation process. METHODS: A total of 40 subjects (10 HIV/HCV, 10 HIV, 10 HCV-infected patients and 10 controls) were enrolled and underwent serum and colonic tissue sampling. The levels of immune activation were evaluated by measuring plasma sCD27, and the levels of choosen proinflammatory, Th2 and regulatory cytokines in both the plasma and supernatant of CD3-stimulated intraepithelial lymphocytes. We also evaluated LEAP-2 expression in the colon biopsies using Affymetrix Human Gene 1.0 ST (HuGene) and fluorescent immunohistochemistry. RESULTS: Increased levels of sCD27 were observed in HIV/HCV coinfected (p=0.03) and HIV monoinfected (p=0.04) patients compared with controls consistent with the presence of immune activation. The chip array identified LEAP-2 expression as a key marker associated with immune activation. LEAP-2 expression in HIV, HCV and HIV/HCV-infected patients was significantly lower compared with controls, and was significantly negatively correlated (p=0.03, r=-0.44) with sCD27. CONCLUSIONS: Our data suggests that HCV and HIV infections are associated with decreased expression of LEAP-2 in colonic tissue. This may represent a key mechanism for enhanced microbial translocation and immune activation in HIV/HCV-infected patients. This publication used a LEAP-2 antibody (#H-075-40) from Phoenix Pharmaceuticals. Shata MT, Abdel-hameed EA, Hetta HF, Sherman KE. Immune activation in HIV/HCV-infected patients is associated with low-level expression of liver expressed antimicrobial peptide-2 (LEAP-2). J Clin Pathol. 2013;66(11):967-75. 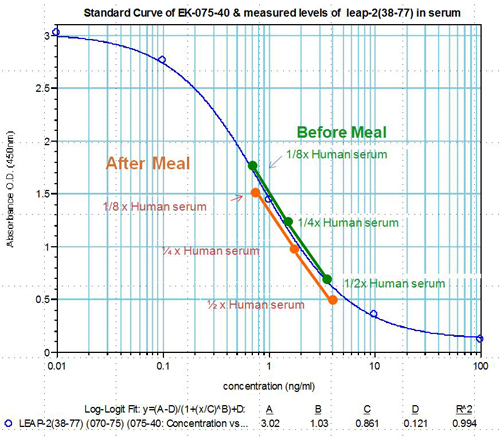 Human serum samples were assayed using our internally developed LEAP-2 (38-77) EIA kit (#EK-075-40). All samples were assayed in duplicate. 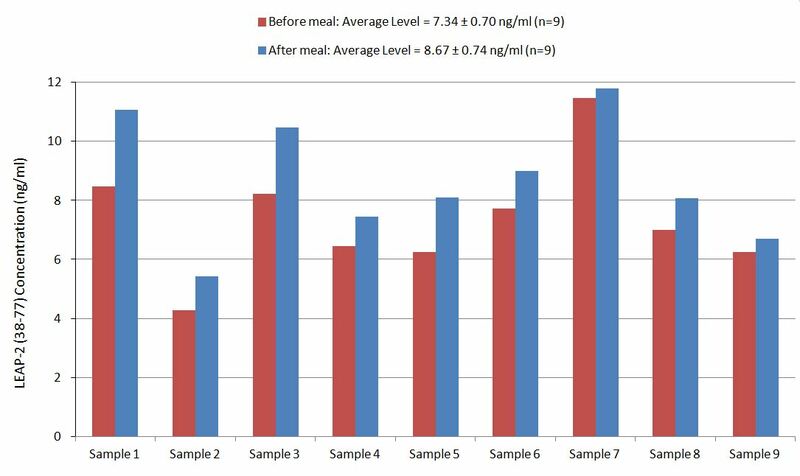 On average, LEAP-2 levels increased by 21% (6.54 ng/ml vs. 7.92 ng/ml) after feeding (compared to overnight fasting). 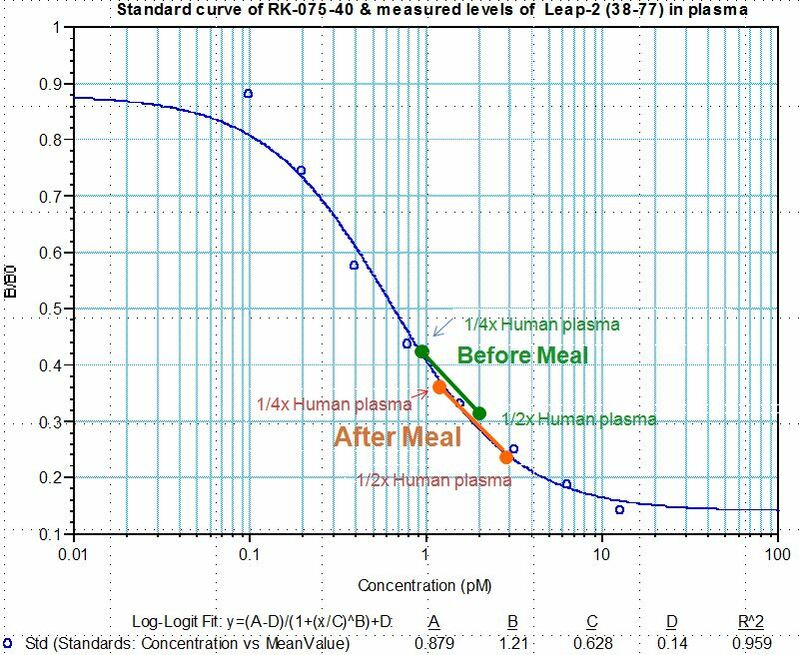 Human plasma samples were assayed using our internally developed LEAP-2 (38-77) RIA kit (#RK-075-40). All samples were assayed in duplicate. 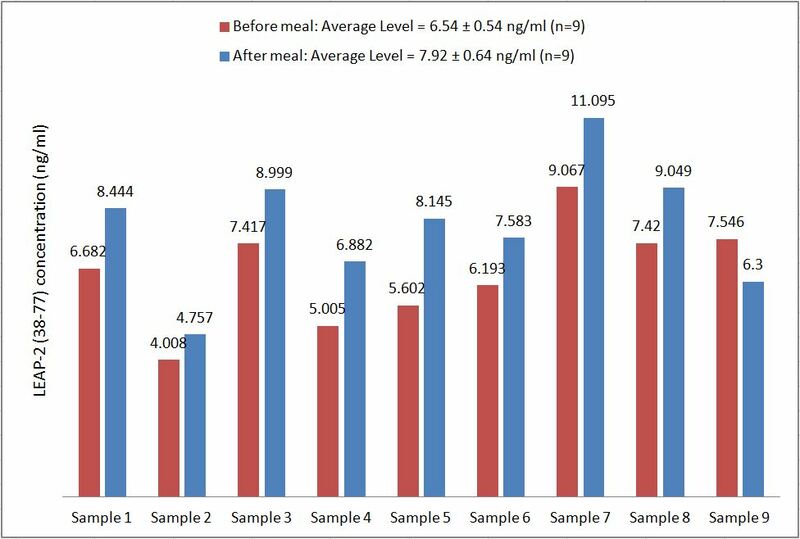 On average, LEAP-2 levels increased by 21% (7.34 ng/ml vs. 8.67 ng/ml) after feeding (compared to overnight fasting). The figure demonstrates that Ghrelin maintains blood glucose levels in the face of starvation and LEAP-2 Peptide modulates ghrelin function in response to nutrient status, such as fasting. Increasing or suppressing LEAP2 leads to the corresponding counter-regulation of ghrelin action in vivo. Alternative splicing in the LEAP-2 gene. (A) Standard PCR conducted with the primer combination E1-S and E3-AS (Fig. 2) and 20 ng of DNase-treated cDNA. LEAP-2350 is mainly expressed in liver, kidney, and colon, whereas LEAP-2550 is the main transcript in lung, trachea, and heart. PCR products at 650 bp, 720 bp, and 870 bp represent splicing variants of LEAP-2, and the band at 480 bp could be identified as a PCR artefact. (MW = marker, 100 bp DNA ladder, Life Technologies). (B) Standard PCR performed with the primers PROM-S (5'-GGTGCA GATTAGGGTGACAGTCCATC-3'), which is located 565 bp upstream of the transcriptional start depicted in Figure 2, and E3-AS. Lung, heart, and trachea exhibit the same pattern of bands, including the 565 bp shift in size caused by the upstream primer PROM-S. The main transcript identified in liver, kidney, and colon, however, changes from the completely spliced LEAP-2350 to the intron 1-retaining LEAP-2 variant. All bands obtained were characterized by DNA sequencing. Northern Blot analysis. 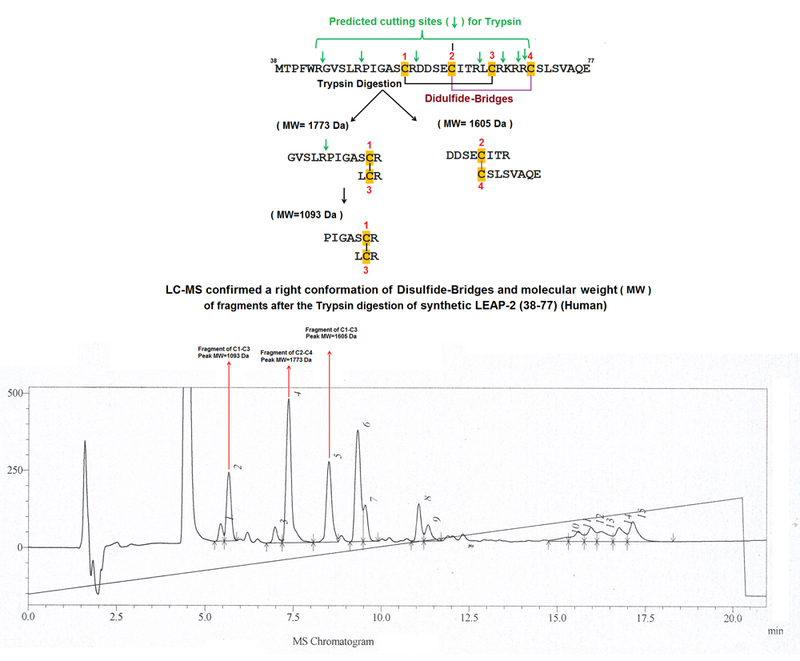 Human MTN Blots I+II (Clontech, A+B) were hybridized under high-stringency conditions with a 32P-labeled LEAP-2-specific cDNA fragment. A transcript size of 0.7 kb identified in liver, kidney, and small intestine represents the complete LEAP-2 cDNA including a poly(A)-tail of 200 bp. The signal at 2.0 kb corresponds to the LEAP-2 form coded by the distal promoter, which could also be identified in 5'-RACE-PCR, whereas the bands at 4.2 kb and 8.0 kb might either represent additional alternative promoter variants or homologous proteins related to LEAP-2. Antimicrobial activity of LEAP-2-(38–77) and LEAP-2-(44–77). Colony-forming unit assay of synthetic LEAP-2-(38–77) (solid triangles) and LEAP-2-(44–77) (open circles), the two main peptide forms isolated from hemofiltrate, against S. cerevisiae ATCC9763. Incubation without peptide represents 100% CFU. Synthetic and native LEAP-2-(44–77) led to similar results. The bars indicate the minimum and maximum value of the triplicates used in this representative assay. The inset depicts the dose-dependent effect of LEAP-2-(38–77) against S. cerevisiae in a radial diffusion assay. LEAP-2-(44–77) showed no effect in this sensitive antimicrobial assay. The antimicrobially active casocidin-I (11 µg/well) served as a positive control ( Zucht et al. 1998). One inhibition unit (1 IU) corresponds to 0.1 mm diameter of growth inhibition zone, and the error bars represent the S.D. calculated from three experiments performed.